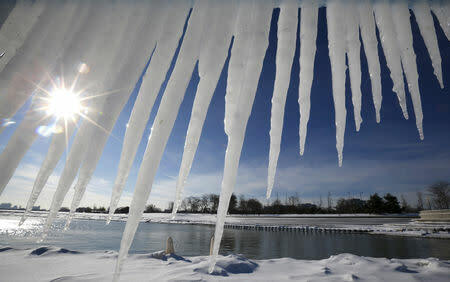 (Reuters) - A deep freeze is forecast to hit the U.S. Midwest this week, with snow, brutally cold temperatures and potentially life-threatening wind chill across northern Illinois and northwest Indiana by midweek, the National Weather Service said. In the Chicago area, snow will begin on Sunday night. Then the "coldest air mass in years" will hit the region on Tuesday with extreme cold lasting through Friday, the weather service said. Record low temperatures are likely by midweek. "I cannot stress how dangerously cold it will be," said Mike Doll, a senior meteorologist at AccuWeather. "An entire generation has gone by without experiencing this type of cold in the Chicago area." Frigid temperatures were already affecting parts of northern Minnesota and northern Wisconsin. The mercury dipped to minus 44 degrees Fahrenheit (minus 42 Celsius) in International Falls, Minnesota, on Sunday morning, breaking the previous record by 8 degrees, the NWS said in a tweet. The agency's Des Moines branch said "dangerous, life-threatening cold air" will impact Iowa from Tuesday morning through Friday morning, with wind chill values on Wednesday likely to range from minus 45 Fahrenheit to minus 55 Fahrenheit across the northern part of the state. The cold front was expected to hit parts of the U.S Northeast as well. Freezing temperatures, though not as severe as those in the interior, and snow were forecast in New York, Washington D.C., Pennsylvania and New England.